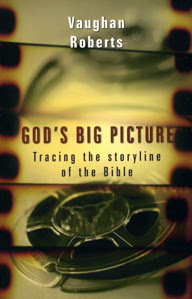 Vaughan Roberts, God’s Big Picture: Tracing the Storyline of the Bible (Downers Grove, IL: InterVarsity Press, 2002), 160pp. Paper. One of the most helpful features of much modern technology is the “zoom” option. From cameras to word processors, the ability to see both small details and the big picture is helpful to understand more about what we are looking at. Vaughan Roberts’ book, God’s Big Picture: Tracing the Storyline of the Bible is one attempt to give students of God’s Word “an overview of the main storyline of the Bible” to provide a helpful framework to keep in mind when studying its parts (20). Roberts helps readers “zoom out” to see what the forest of biblical theology looks like so we can better understand the purpose of the individual trees in the Bible and thus “get [our] bearings when [we] land in any part of it” (20). God’s Big Picture sees the kingdom of God as the unifying theme that shows how the Bible fits together. This theme is not forced upon the Scripture but arises out it and it sufficiently encompasses the whole of Scripture in a way that allows “each part to make its own distinct contribution” (20-21). Furthermore, “God’s kingdom was the dominant theme in Jesus’ teaching” (21). The kingdom of God is understood to be presented throughout Scripture as “God’s people in God’s place under God’s rule and blessing” (21). In eight chapters, the book traces the kingdom motif throughout the Bible. “The Pattern of the Kingdom” introduces us to elements of this unifying them by looking at Genesis 1:1-2:25. “The Perished Kingdom” (Gen. 3) shows the results of man’s rejection of God’s kingdom. “The Promised Kingdom” (Gen. 17:1-8; Gal. 3:6-14) focuses on God’s promises of salvation. It particularly emphasizes God’s covenant with Abraham, which promised a people, a land, and blessing, and shows that, from the start, the kingdom of God was intended to include Gentiles as well as Jews. “The Partial Kingdom” (a lengthy chapter in comparison with the others) covers passages ranging from Genesis 12 to 2 Samuel 7:1-17 to trace the kingdom through the history of Israel and highlights the promise of a king. “The Prophesied Kingdom” focuses on the role of the prophets in announcing the coming fulfillment of the promises of the kingdom of God. The chapter shows how Jesus brings the kingdom of God. As for God’s people, Jesus did what Adam and Israel failed to do. Jesus is the place of God’s kingdom, fulfilling the purposes of the tabernacle and temple. God’s rule and blessing come about through the new covenant Jesus establishes and the blessing that flows from His kingship. These things came about through the “triumphant success” of the cross (114). There was no other way for Christ to bring God’s kingdom apart from His obedience to the Father and death as a substitute for sinners. His resurrection inaugurates a new age of God’s blessing. Roberts’ bite-size overview of the Gospels culminates in his assertion that the kingdom has come, although it has not yet come in its fullness (119). He compares Jesus to a conductor who has returned to offer salvation to those who have refused to play God’s tune. While some submit to this redeemer, they will continue to play some wrong notes and produce discord, since there is still a future aspect to the kingdom (118-119). In “The Proclaimed Kingdom,” the author says, “The promises of the kingdom will not be completely fulfilled until [Christ’s] second coming” (123). He gives 2 Timothy 3:1 and James 5:3 as reasons for viewing “the last days” as the time between the first and second comings of Jesus, meaning that, according to New Testament usage, we have been in the last days for the last two millennia. God has delayed Jesus’ return “so that more people will have a chance to hear the gospel and repent before it is too late” (125). Right now, God is working by His Spirit through the proclamation of the gospel to extend His kingdom. The Spirit is reversing the judgment of Babel (separation of nations along linguistic lines) and, in a way peculiar to this age, He indwells and empowers believers to bear witness to the truth before those who do not believe. The return of Jesus takes place after the gospel is preached to all nations. The church is God’s people (131). God’s place is this holy people who trust Christ. God’s Spirit dwells in us individually and as a Christian community (131), and helps us to enjoy God’s rule and blessing by living according to His standards (132). The present age leaves us longing for “The Perfected Kingdom.” In this chapter, Roberts surveys the book of Revelation to show what God has told us about the complete fulfillment all His promises, particularly as His people are with Him in the new creation, in the new temple, enjoying His rule and blessing forever. The book has several advantages. Its brevity and ease of reading make it accessible to a wide audience, even as young as high school. Most of the chapters are short and include questions for discussion and application, making it ideal for Sunday school, classroom use, or personal study. It contains many helpful charts. It whets the appetite for further Bible study and is useful even for students advanced in their hermeneutics that may be familiar with the minutiae of Scripture but have forgotten what the view of the whole thing looks like. It is common to hear that we should interpret a text in light of its immediate context, the book that it is in, and the whole Bible, but sometimes it is difficult to see how it fits in with the rest of the canon. Vaughan Roberts has given us a resource that helps in this area. As useful as the book is, the reader should be aware of Robert’s views of the interpretation of the days in Genesis 1, the nation Israel, and eschatology. These particular concerns would keep me from recommending the book for private study to those without a good grounding in the Scriptures and Christian theology. However, such an issue may well matter a great deal, as one’s view of the days of Genesis could impact one’s view of the historicity of Adam and Eve, the origin of sin, and even the events of the gospel itself. Some spiritualize the days of Genesis into long ages simply to accommodate a supposed body of scientific evidence that would render the literal interpretation nonsensical. These interpreters may well be guilty of compromising the very foundations of the gospel (albeit unintentionally). Dispensational readers may quickly notice that Roberts’ does not share their views on the nature of Israel and predictive prophecy. His amillennial eschatology surfaces frequently in the last half of the book (I write as a premillennialist). It would have been helpful to see his analysis of Romans chapters 9-11 (especially chapter 11) in regard to these points. Neither the 1,000 years of Christ’s reign nor the 144,000 should be understood in terms of literal numbers, according to Roberts (145, 148). The lake of fire is seen to represent eternal death; Roberts does not clearly indicate whether he thinks this means there is an eternal conscious torment of the damned or not (144). Revelation 20:2-3 speaks of Satan being bound and then thrown into the Abyss at the start of the thousand-year period. There is good reason to believe that those events have taken place in the past. Revelation 12:10 makes it clear that Satan has already been hurled down from heaven. He was defeated by the death and resurrection of Christ and has been bound ever since. He is powerless to stop God calling his elect into his kingdom, but he has still not admitted defeat and continues to attack God’s people. Revelation 11:7 describes him coming up from the Abyss to attack the witnessing church. He could not have come up from the bottomless pit if he had not already been thrown down into it. I believe that occurred when Christ died and rose. That is when the millennium began. It will continue until just before the return of Christ. These concerns should not result in a dismissal of Roberts’ book, but they need to be pointed out. Because of them, I think the book would be most useful in a classroom setting or a discipleship/mentoring relationship where a more competent teacher can help the student when these issues arise. Vaughan Roberts’ small volume of biblical theology is useful to help us “zoom out” and see the big picture of the Bible. Despite the caveats given above, the book is still valuable to help us see what the Bible is all about so we can interpret its parts in light of it as a whole. God’s Big Picture is a great starting point for encouragement to be better students of God’s Word, clear proclaimers of His truth, more obedient children of God, and more faithful evangelists in spreading the good news of King Jesus. This entry was posted in biblical theology, book reviews, hermeneutics, resources and tagged biblical theology, book reviews, hermeneutics, New Testament, Old Testament, resource reviews, resources. Bookmark the permalink.